There are a few secrets to learn before you create some great gnocchi – how to maintain the perfect texture, how to resist over-cooking – and above all, how to make it taste fabulous! This class will show you how to process the ingredients – and, in fact, which ingredients to use: the right potatoes for the best result and, the right gluten free flour for the tastiest gnocchi. The cooking process, too, is key to a perfect result – it’s just as important as the ingredients. Sabine will also show you how to use the rigagnocchi to shape the gnocchi in the best way so that the delicious sauce will coat it perfectly. a special recipe called Burro e Oro to dress the gnocchi. At the end of the class, you will have the opportunity to taste this fabulous dish and Sabine will be available to answer any questions that might have arisen during the class. As a bonus, you will get to take home some fresh gnocchi. 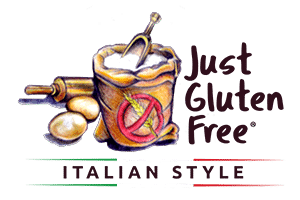 Just finish the preparation and cook – and you will have your first home-made gluten free gnocchi! In addition, you will also receive a Just Gluten Free Gnocchi mix flour and the recipes to add to your collection.